Storage Studio Projections Expandable Paper Holder - ADVANTUS-Cropper Hopper Projections Expandable Paper Holder. Lose the mess and keep the memories with Cropper Hopper Projections! This paper holder features ten tabbed dividers and can be used for top- loading or side-loading paper. It expands to 9 inches wide and can hold 900 sheets of paper. 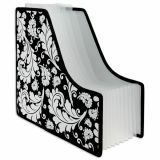 Plus it has a durable canvas exterior with a fashionable black and white print! 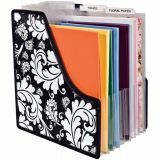 This package contains one Paper Holder that measures approximately 13-1/2x14-1/2x9 inches expanded. Imported.